Blesbok stand about 95 cm / 38 inch at the shoulder and reach a mean mass of about 70 kg / 155 lb.. They are medium-sized with a stronger body than springbuck or impala. Blesbok have a distinct white marking in their face, on rump and legs. Both sexes carry heavily ridged, lyrate horns which, rising outwards from the bases, curve backwards and inwards to end in a pointed tip. The horns of the doe being smaller and thinner. 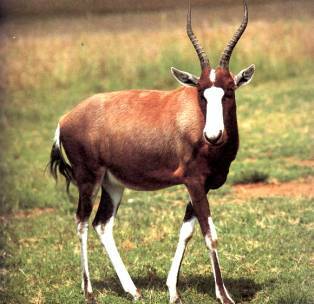 Blesbok are generally bright brown in colour, glossed with a purple sheen, which changes into a reddish to yellowish brown on shoulders and back. Adult bucks are generally darker in colour. Their white face marking extends from the horns to the nose being broken by the brown band just above the eyes. With blaze on the forehead. Pale-white buttock patch, tail white at the base, white under parts. No natural population in Namibia. Living in all regions of Namibia, through introduction. Grazers, with a preference for feeding on short grass. Blesbok drink regularly, sometimes twice a day. Both sexes carry similar horns but those of the doe are smaller and lighter. The horns of an adult buck may have a length up to 45 cm / 18 inch. Gregarious species, socializing in herds of up to 30 animals. Frequently, several herds of Blesbok are found together in aggregation of more than 100. Territorial bucks hold their territories by chasing and fighting off other males. Cheetahs are a principal enemy. They often decimate a whole herd over a period of time.